One of the central themes of the upcoming Purim festival is “venahafoch hu”, lit: And it was turned about. The wicked Haman plotted to kill all the Jews, and his evil plans were turned on their head, whereby the Jews were saved and Haman and his sons were killed. The anti-Israeli group Students for Justice in Palestine – a misnomer if ever there was one – found themselves on the receiving end of a bit of justice. And they did not like it one bit. 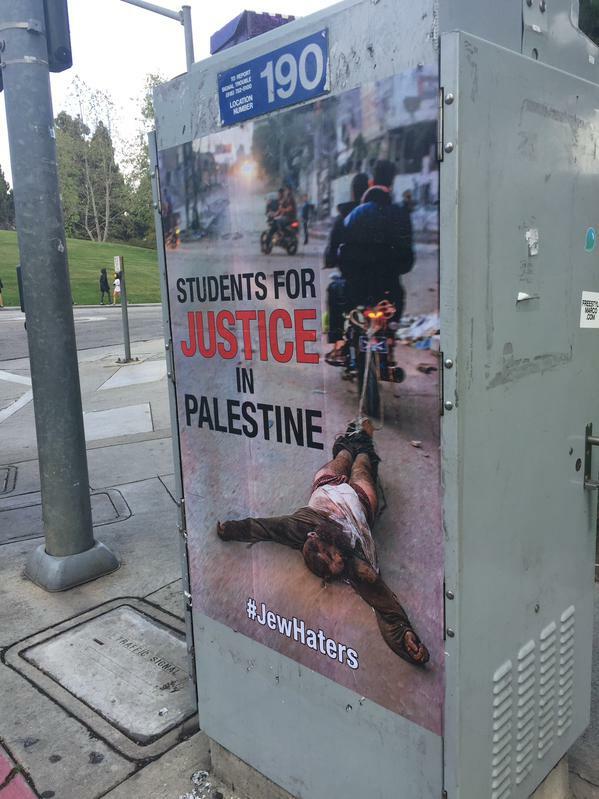 UCLA’s chapter of anti-Israel group Students for Justice in Palestine (SJP) was enraged by a series of posters depicting Hamas executions that appeared early Sunday around the school campus. The group, which has often been accused of antisemitism, claimed that it is an organization that prides itself on its opposition to racism and bigotry, and that it is open to students “from all walks of life.” Furthermore SJP said they are concerned that they flyers will delegitimize their efforts to persuade university regents to boycott, divest from and sanction Israel. One of the posters depicts a Gazan with a bag over his head as Hamas executioners stand by his side, while another shows the body of an alleged collaborator being dragged through the streets of Gaza. Each sign was tagged with “Students for Justice in Palestine” and carried the hastag “#JewHaters” at the bottom. The flyers were spotted all around the UCLA campus including kiosks, fraternity and sorority rows, and at an apartment complex that houses undergraduate students, SJP said in its statement. Those responsible for the posters told The Daily Caller anonymously that the victims depicted in the posters were accused of supporting Israel. The source referenced stories of those who were tortured and killed by Hamas after aiding Israel, according to the report. One would think that there would be nothing to object to in pointing out the barbarity of Hamas against its own people, and if SJP are as pro-Palestinian as they claim, they should have no problem with this. But of course they are not pro-Palestinian. They are simply anti-Israel. Israel’s Ambassador to the United Nations Ron Prosor sarcastically handed out “Oscar” awards to other member states at a Security Council session on Monday, the morning after Hollywood recognized its own stars. “Last night Hollywood celebrated the Oscars, and as millions tuned in, I thought of the following: If the Oscars for Maintenance of International Peace and Security were given at the UN, I would not be surprised if these candidates were awarded a prize,” Prosor said at the session devoted to reflecting on history, and reaffirming the strong commitment to the purposes and principles of the UN Charter. “In the Best Actor Category – for acting like a peace loving country while developing nuclear capabilities, denying the Holocaust, and threatening the destruction of another member state… the Oscar goes to Iran,” the diplomat announced. “In the category for Best Visual Effects – for making women disappear from the public sphere, the Oscar goes to… surprise surprise… Saudi Arabia. No competition there. Those words apply equally to the absurd claims of the various “justice for Palestine” groups whose only wish is in actuality to destroy Israel. This entry was posted in Lawfare and Delegitimization, Terrorism and tagged anti-boycott law, Hamas, Oscars, Palestine, Palestinians, Ron Prosor, SJP, terrorists, UN. Bookmark the permalink.